A round of drinks for everyone! Cart2Cart has something to celebrate! What’s the fuss about? First of all, Cart2Cart has established a support of Zoey -- a premium e-Commerce platform for ambitious businesses. Being literally a “Magento in the Cloud”, Zoey’s easy-to-use SaaS solution allows to create your own Magento-based store in as little as a week -- polished, tuned and destined to get successful. Secondly, having Zoey joined our family, Cart2Cart reached a new milestone -- 70 supported shopping carts! Three cheers for Cart2Cart! Hip, hip, hooray! 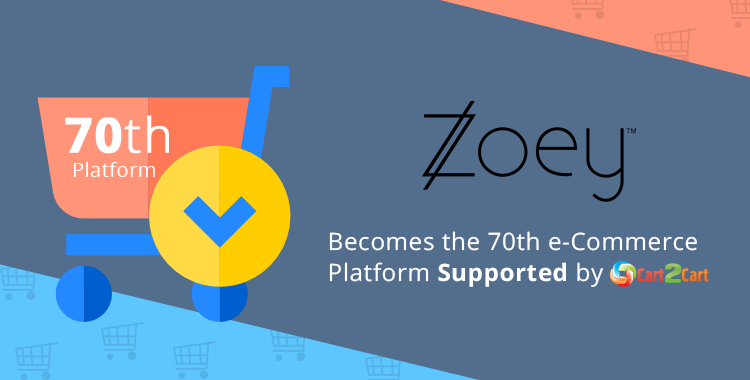 In practice, it means that you can migrate to Zoey from 70 world’s most popular e-Commerce platforms: easily, swiftly and automatically. It also means you’re only a few steps away from gaining a competitive advantage your market rivals won’t ever forgive you. So is it worth waiting? Start with a free Demo and get your store data transferred to Zoey automatically! Meanwhile, we’ll finish our fifth bottle of “Pol Roger Sir Winston Churchill” champagne. Help yourself, don't be shy.